People in the last stage of their lives need a personalised integrated joined-up approach to their care to enable them to live well and die well. With an estimated third of healthcare budget spent in the last year of life, there is a need to prevent over-hospitalisation, wasted resources and poor quality of care that is at variance with peoples’ wishes as they journey through this complex terrain. So a population based approach to end of life care is required to proactively identify and actively support all people in their final year/s of life, seek to listen to their needs and preferences and plan ahead across every setting to deliver care in alignment with their wishes, whilst also reducing crises, wasted resources and over-hospitalisation. GSF is widely used in many areas and settings as a vehicle for change to improve proactive care for people nearing the end of life in any setting with any condition. Specific changes include early identification of more patients, more offered advance care planning discussions, more dying where they choose or in usual place of residence, better carer support and improved care in the final days. The pioneering GSF accredited practices, care homes and hospitals demonstrate what is possible to achieve in all these areas (see table below). 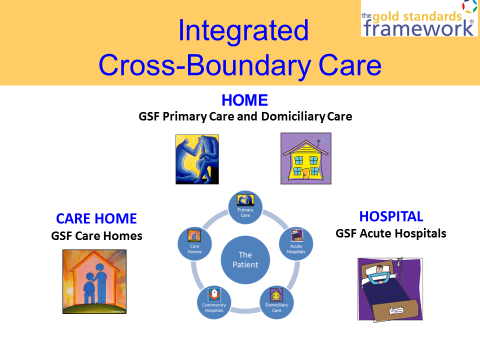 Several areas have used GSF as a vehicle for change for whole system thinking where they have established it in at least 3 settings (hospitals, primary care and care homes), and are now brought together as the GSF Cross Boundary Care Communities of Practice. 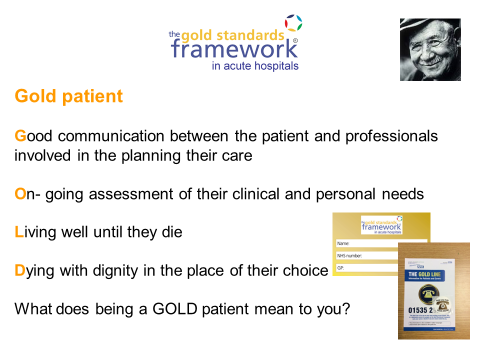 Early evaluations have shown an increase in coordinated care across different settings, integrating health and social care systems and leading to better patient outcomes, and improved experience of care of the GSF or ‘Gold’ patients. This significantly adds to the success of information transfer systems such as EPaCCS in an area, and they also explore how this joined-up approach can benefit such ‘gold’ patients and their families, by developing additional resources and support available to them. 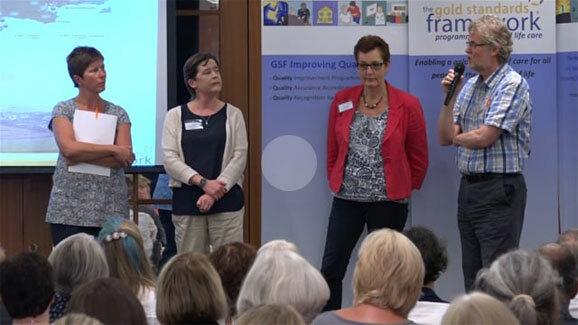 Current GSF Cross Boundary care sites include Dorset, Nottingham, Airedale Bradford and Craven, Barking Havering and Redbridge, Morecambe Bay/Lancaster and Jersey - with the latter including introducing GSF to all health and social care providers at the same time. Several have been working on this for many years, attaining significant benefits and have built upon this with additional successes such as use of EPaCCS, Gold Line etc. 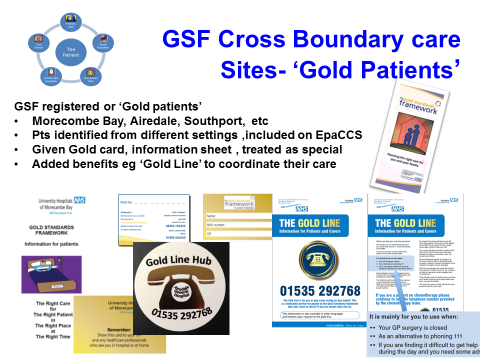 In one example, Airedale and Craven they have introduced GSF into most hospital wards, over a dozen GP practices and over 30 care homes leading to earlier identification of GSF patients via their EPaCCS system, GSF patients being given 'Gold ' cards, and a specially funded 'Goldline' as an emergency help-line for such patients. 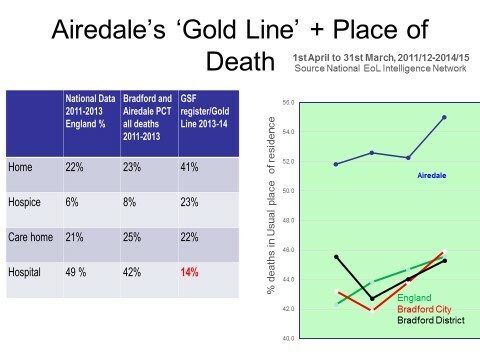 They have shown significant early signs of progress with decreases in hospital deaths from 49% to 14% and increases in home deaths (22% to 44%) for GSF patients on the Gold Line. Other areas have introduced GSF training to several sectors, with whole-system thinking and some ‘Better Together’ events to help improve coordination and communication across sectors. Many have developed Gold Cards and used their EPaCCS registers to support better information transfer. They establish significant benefits of being ‘Gold’ or GSF patients including rapid access to out of hours support, quick response from GP practices, free car parking, open visiting, better access to information, benefits and other support. Attainments of GSF Accredited Teams- GP Practices, hospitals and care homes. These pioneering practices, hospital wards and care homes demonstrate what is possible to achieve in each sector related to key measurables, thereby encouraging others that such attainments are achievable in their area. 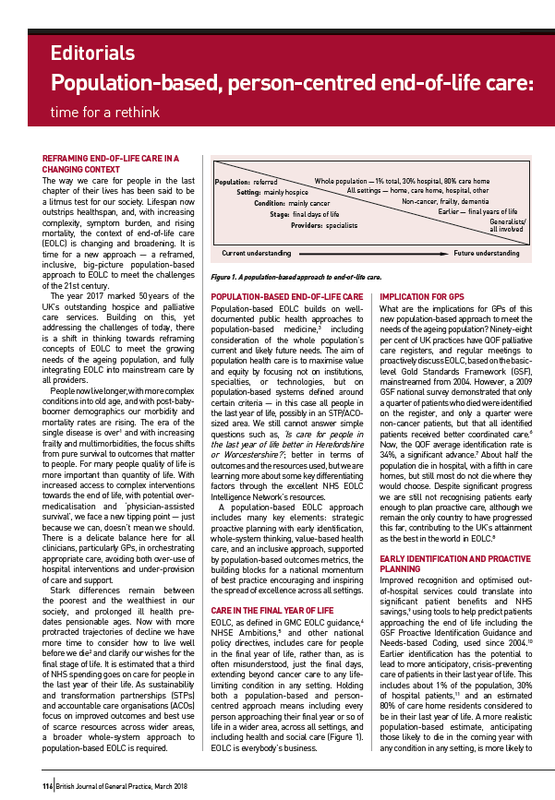 By putting patients at the heart of care, and developing a broader concept of population–based proactive supportive care for all people approaching the end of life, the challenges that we face with the ageing population can be addressed in a humane and cost-effective way to ensure both gold standard care and best use of resources.